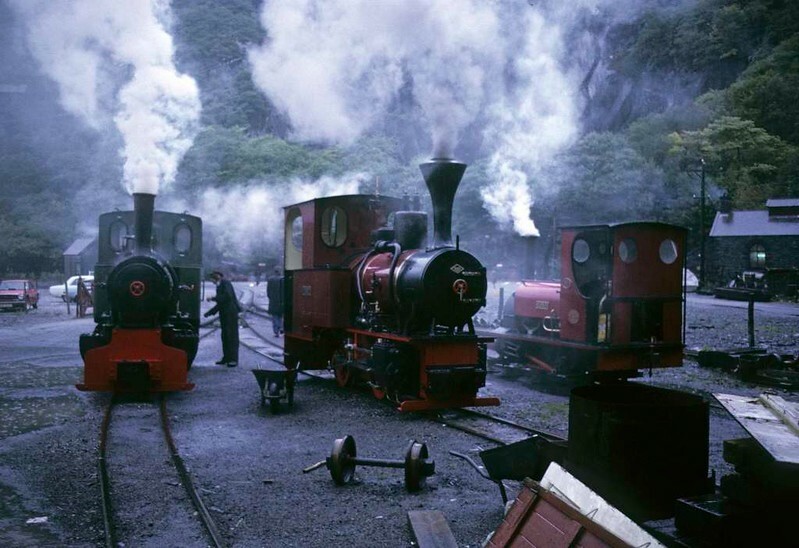 Cyclops, No 9 & No 1 Elidir, Gilfach Ddu, Llanberis Lake Rly, 6 October 1974. Getting up steam outside the workshops as the rain pours. Cyclops is Jung 0-4-0WT 7509 / 1937. No 9 is Orenstein & Koppel 0-4-0WT 12722 / 1936, and in 2017 was on the Bredgar & Wormshill Rly. Elidir is Hunslet 0-4-0ST 493 / 1889, still at Llanberis in 2017. Photo by Les Tindall.